PRODUCT DESCRIPTION: This is a unique trap which combines the features of the Excluding Valve and the Repeating Trap. Designed to both exclude and capture target animals like squirrels and rats, this trap is ideal for use where entry/exit holes are known to exist. This model features 4 flaps on one end which are placed over the hole through which the target animal is passing. 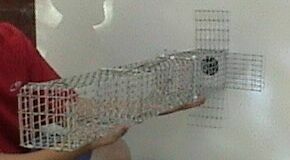 The first section of the trap works as a one way valve allowing animals to exit but not enter the hole over which it is placed. Typically trapped animals will work their way to the front of the trap where they will remain till you remove them. Having two sections to hold animals allows the trap greater flexibility in that it can hold several at one time comfortably. WHERE TO USE IT: Most commonly used on the sides of homes and other structures where animals like squirrels are active, these traps should be used outside. Mount them over entry holes by nailing or stapling the four flaps securely to the structure. Be sure to attach it well enough so it won't move when animals pass through it's doors. Also, since these traps can hold several animals, they can get a lot of weight inside them making it extra important to attach them well. RATE OF APPLICATION: As many as needed. If you have two holes, two traps should be used. Each trap can hold several animals limited only by the size of the target animal. One can hold 2-4 grey squirrels and 5-10 flying squirrels.